You are currently browsing the tag archive for the ‘Public Art’ tag. Feathers fall from the sky all the time. The wind plucks them from birds’ bodies, and they fall fast whilst spinning in circles. Once upon the ground, human fingers may pick them up and gaze at the way light shines through. Or perhaps they just sit there on the cold gray ground, eventually turning to city grunge under the feet of fast-moving pedestrians. 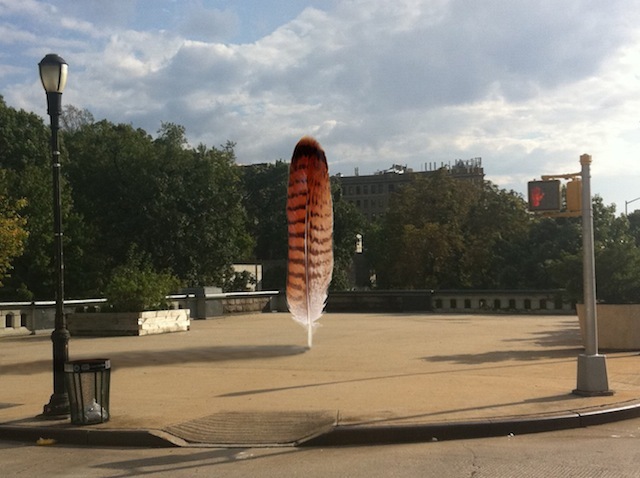 What if one of those feathers was blown up to epic proportions and positioned in a highly-trafficked space? Brooklyn-based sculptor Petros Chrisostomou is in the process of creating “Sky Feather,” his first large-scale artwork in New York City — a giant feather that will occupy a public space in Harlem at the median of 124th and 125th Streets and Lenox Avenue. The New York City Department of Transport has already given Chrisostomou the okay to use this public space. Now he is raising funds for the creation of it via the crowdsourcing platform USA Projects. The project will go into production in January 2014 and will be installed by early April 2014, where it will remain on view for one year. The artist Andy Goldsworthy is creating a new work for the Presidio of San Francisco, the national park that was formerly a military base. The artist will hang a felled tree covered in cracked clay from the ceiling of a building within the park that was once used by the Army to store explosives. 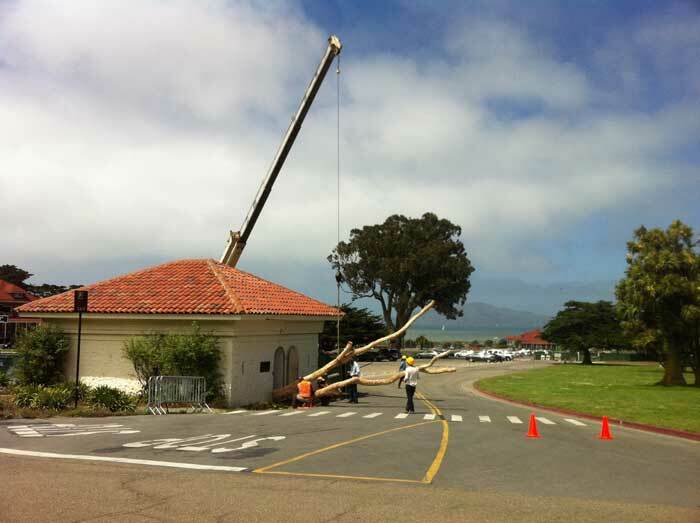 According to the Presidio Trust’s website, Tree Fall will be “a fully reversible” work installed in the Powder Magazine building, “a small (25 feet by 30 feet) and currently inaccessible masonry structure”. “The gunpowder room would’ve been a fairly dangerous place to be, so [the work] will have that sense of caution to it,” Goldsworthy says. Due to be completed by the end of August, Tree Fall will be the artist’s third project in the park, following Spire, 2008, and Wood Line, 2011. 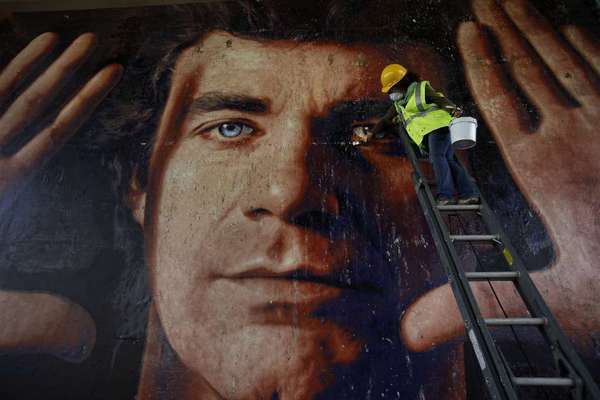 Later this summer, following years of legal skirmishing and politicking, the Los Angeles City Council is expected to vote on whether to lift its decade-old ban on private-property murals. Some questions surrounding the proposed ordinance have been around since at least 1932, when the Mexican muralist David Alfaro Siqueiros painted his polemical masterpiece “América Tropical” in downtown Los Angeles, which was subsequently whitewashed and finally restored last year. Among them are: What happens when an individual artist or property owner’s free-speech rights collide with another group’s aesthetic preferences or personal views? Who gets to decide what’s art and what’s “vandalism” — elected officials, cultural appointees, police officers, neighborhood councils? And, ultimately, what sort of open-air visual environment does Los Angeles want to foster? Art preservation is tricky even under ideal circumstances, which generally involve close controls for light, temperature, humidity and other hazards. Eliminate those and you have some idea of the challenge that street-mural preservation faces. The only surviving exterior work in the U.S. by the renowned Mexican muralist David Alfaro Siqueiros, Los Angeles’s “América Tropical” (1932), is only now receiving a roof. Ironically, its longevity is due to a paint-over that preserved it from the ravages of nature. Most murals, in a world of unfriendly ordinances and inevitable shifts in the urban landscape, are not so fortunate. Happily, a number of national and local organizations have recently mobilized to ensure that the preservation of murals need not be any more difficult than rain, snow and sun already render it. 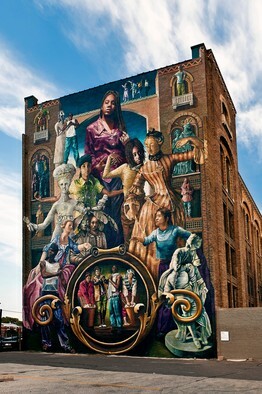 The organization Heritage Preservation launched a “Rescue Public Murals” initiative in December 2006, using funding from the Getty Conservation Institute and the National Endowment for the Arts. It first conducted a national assessment, paying particular attention, according to project director Kristen Laise, to “cities which had a long history of mural creation or of issues with preservation.” Then it selected for examination 16 murals in locations ranging from a commuter rail underpass to an abandoned church, and depicting topics from the end of the Marcos dictatorship to the laborers of San Francisco’s Chinatown. Some of the greatest art in the world is public art, including Michelangelo’s David, the fountains of Bernini and Rodin’s Burghers of Calais. Those are lofty masterpieces. A few notches down in sublimity but beloved of locals and tourists alike are such icons as Eros at Piccadilly Circus, or the mermaid in Copenhagen harbour, or the Statue of Liberty. It is important to remember such triumphs as the debate over public art in Britain deepens. A few years ago, expensive public commissions seemed almost beyond criticism. Today they seem a sitting target for denunciation. It surely reflects a depressed economy: a depressed nation? Yet with the typical messy and inaccurate nature of artistic debate in Britain, where people sometimes seem to look with their mouths rather than their eyes, the sculpture that is taking the flak for years of excess in British public art is actually a fine example of the genre. 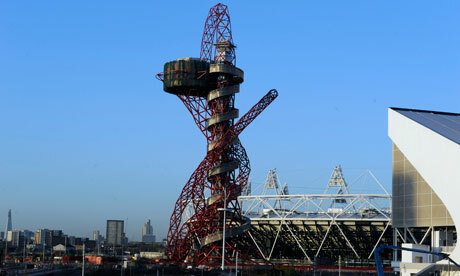 Anish Kapoor and Cecil Balmond’s Orbit is a daring, imaginative and exhilarating work of art. It does not deserve to be pilloried – on the contrary, if all British public art were like this, it would be an age of glory. After nearly half a year of delays, the Los Angeles County Museum of Art’s 340-ton monolith, sitting in a Riverside County quarry, will begin its long, circuitous journey to the museum Tuesday night. The boulder will hit the road on its custom-built transporter about 10 p.m. and will move at about 5 miles per hour. It will travel at night only. It’s due to arrive at LACMA early March 10. 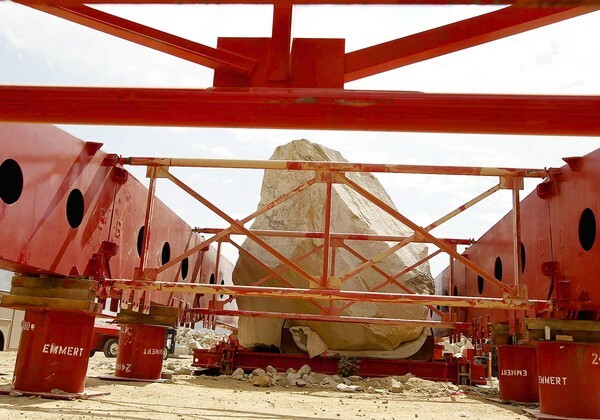 The rock will travel through four counties and 22 cities, so it’s no surprise that the numerous delays have been mostly due to permit issues — not to mention the logistics of moving a two-story-high chunk of granite, weighing 680,000 pounds, through congested urban areas. More than 100 utilities will be affected by the rock’s passage, and utility crews will travel with the rock to temporarily remove power lines, traffic lights and other obstacles, then immediately restore them once the rock has passed through. The rock’s first stopping point, at 5 a.m. Wednesday, will be at Mission Boulevard and Bellegrave Avenue in Ontario. Heizer will not be at the quarry to see his rock off; but museum director Michael Govan plans to give a short address. 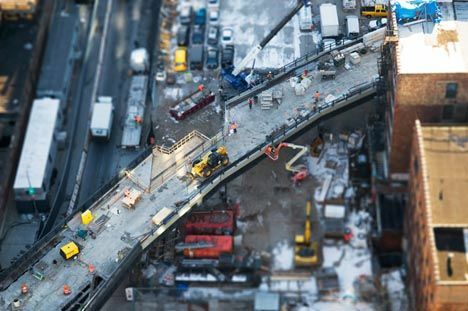 When the High Line opens its second segment, known simply as Section 2, in the Spring next year, it will double the length of the public art park. This will “greatly increase the possibilities for artists to work site-specifically,” says Lauren Ross, the curator and director of art programmes for Friends of the High Line. To coincide with the opening of Section 2 in the Spring (a more definite date could not be confirmed), the High Line Art is installing a warmly welcoming sound piece by artist Julianne Swartz titled Digital Empathy (Feel Safe in the Knowledge that Life Loves You). At 11 different stations located throughout the park, visitors will hear computer-generated voices, “delivering messages of empathy, support, and love” according to the press materials. But before this, the organisation kicks off its spring season with a new three-piece sculptural installation by Kim Beck called Space Available which mimics the skeletal framework that supports billboard advertisements, but are actually flat cut-outs of perspective drawings. The Dia Art Foundation is a unique thing, a non-profit that collects a limited roster of artists in depth, especially Minimalists and Conceptual artists, and gives them the kind of long term exhibition space their work requires. This can get tricky when you’re talking about something like Walter de Maria’s New York Earth Room, a big spanking white room covered in about two feet of soil, an installation they’ve supported for decades in SoHo. In the 1970s, ’80s and ’90s, Dia was a force to be reckoned with, and generally a force for good. In the hubble-bubble of the New York art world, they represented the values of the long duration. But in 2003 they opened a big new exhibition space in a converted Nabisco box factory in Beacon, N.Y., on the banks of the Hudson River about a hour north of New York. Around the same time they also shut down their headquarters in the Chelsea neighborhood of lower Manhattan, where they did changing exhibitions. Beacon is a great place, but gradually Dia faded from view in New York. Now they’re finally coming back. The map of Michael Bloomberg’s New York bears the scars of vast, unfinished dreams of renewal. Hudson Yards, Atlantic Yards, Coney Island, Willets Point, ground zero, Governors Island, the Gowanus Canal—all those glittering megaplans, derailed, deferred, or debased. Yet the Bloomberg administration can claim triumphs at a tiny scale: Station house by station house, library by library, the city has been doggedly smuggling high-level architecture to the neighborhoods that need it most. The blue lights were flashing as the Boston Police car approached the traffic island in Copley Square. Christos Hamawi, standing by with his brushes and paints, didn’t panic. He reached for his permit. He didn’t just have permission from the city to paint the gray electrical box outside the Westin Hotel. He had been hired for the job. Hamawi, 36, is one of about two dozen local artists brought in by the Boston Arts Commission as part of its PaintBox program. Modeled after similar efforts in Cambridge, Somerville, and other cities, the program started slowly last year with 13 boxes but has expanded to more than 40.